The German general election on September 24th is coming up in just a couple of days (see also our contributions on ticket splitting and predictive models). Not only the voters but certainly also many candidates are awaiting the results fiercely that decide upon their party’s electoral fortunes. In Germany’s mixed electoral system, candidates have two ways to enter parliament: by winning one of the 299 single member districts or via 299 seats distributed by party lists in one of the sixteen states (Länder). The top list placements are high in demand, since holding one of the first list positions increases the likelihood to enter parliament. So, the competition within parties for these placements should be strong. Are men more likely to receive the most desirable spots on party lists in the German general election 2017? Previous literature would expect that this is the case, because women are less likely to be incumbents. Experience as MP, better networks, and higher visibility enhance the likelihood to be put into the front seat. Considering the low share of women in parliament that can profit from such an incumbency bonus and their lack of experience with intra-party competition for high-list placements, we might expect that female candidates less frequently hold viable list positions than their male colleagues. 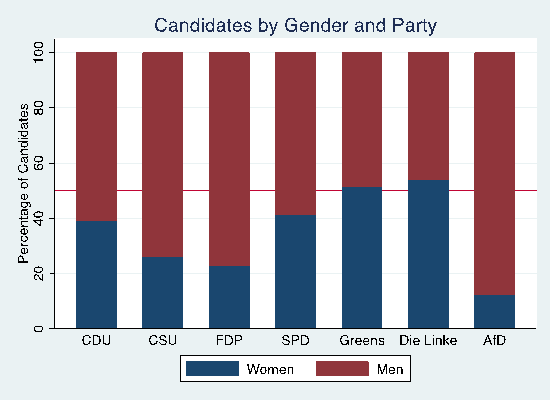 To determine the effect of gender on list placements in the German general election 2017, I analyzed data from all candidates running on party lists for the Christian Democracts (CDU), Christian Social party (CSU), the Social Democrats (SPD), the Liberals (FDP), Greens, the Leftist party (die Linke), or the Alternative for Germany (AfD) (Bundeswahlleiter 2017). Besides gender and incumbency, I include variables controlling for age, socio-economic status of candidates based on occupation (ISCO 08), and labor force participation of women by State (Regionalstatistik 2017). Table 1 shows the results of a multilevel regression with fixed effects and candidates nested at the state level. The findings appear to be astonishing: From all candidates that are running on lists, not only incumbents but also women seem to be more likely to receive higher list placements (if they have the same experience, age, and socio-economic status). The findings proof to be very robust even when opting for different variable specifications such as save seats based on the predicted list mandates received by parties, or including various interaction terms i.e. of gender and parties. Also, pure list candidacy does not drive the results. In contrast, when I reduce the sample to those candidates that only run on party lists but not in districts (model 2), the conclusion remains the same: from those running, female candidates have an advantage in the Germen general election 2017. Table 1: Multilevel-mixed effect models with candidates nested at the state level for the chance of higher list placement depending on gender and incumbency. Annotation: Statistical significance is indicated as follows: * p < 0.10, ** p < 0.05, *** p < 0.01. While this sounds like good news for women, there are also some bad news to tell: On average only 35 per cent of candidates that are running on party lists are female. However, as Graph 1 shows, this share varies considerably between parties. The leftist party and the Greens outperform their self-imposed gender quota of 50%, while the share of female candidates running for Merkel’s Christian Democrats and Schulz’s Social Democrats amounts to around 40% and only around 1/4th of candidates on the Liberal party’s and the Christian Social party’s lists are female and almost 90% of the places on the list of the Alternative for Germany are filled with men. The parties with an unbalanced list regarding the share of male and female candidates decided to put women upfront on rather high list positions and that increases winning chances. Nevertheless, it also implies that this imbalance will translate to an unequal composition of the German Bundestag. Most certainly, after the general election, the German parliament will once again include more male than female representatives. Graph 1: Share of male and female candidates running on party lists in the German general election 2017 by Party. The good news for women in Germany and female candidates running in the election is that from the pool of candidates, women have better chances to gain higher placement on electoral list than men. This is somewhat clouded by the bad news that only two parties have gender equal lists. In addition, the gender bias in candidacy might be even stronger in the single member districts: possibly, women are more likely to run in chanceless districts. This has not only far-reaching consequences for the numerical representation of women, it also affects how parties and the legislature represent women’s interests, since women tend to care about different issues than men and are more likely to hold liberal attitudes (Studlar, McAllister et al. 1998). If you interested in learning more about the regional distribution of female candidates in Germany and comparisons to other countries, look at an interesting contribution by Paul Bauer and Julia Scholte-Cloos at the LSE Blog. Studlar, D. T., et al. (1998). "Explaining the Gender Gap in Voting: A Aross-national Analysis." Social Science Quarterly: 779-798.